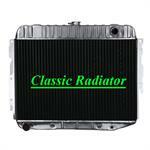 Find classic aluminum radiators by vehicle manufacturers. Aluminum radiators by US Radiators are available. View inventory. Shop for US Classic Copper Radiators by vehicle manufacturers. View inventory. 64 to 66 Mustang V-8 and Falcon & Comet aluminum radiator.This radiator is manufactured with two rows of 1" tubes on 7/16" centers. This creates a core with better cooling capacity than a conventional 4 row copper core. For later V-8 conversion. This radiator has 4 rows of 1/2" tubes. It has a trans cooler. The core height is 15.5" and the width is 25.5". The tanks are 3.25" thick. The top hose connection is on the driver side and the lower is on the passenger side. This radiator has 2 rows of 1" tubes. It has a trans cooler. The core height is 15.5" and the width is 25.5". The tanks are 3.25" thick. The top hose connection is on the driver side and the lower is on the passenger side. MADE in USA!! This radiator has 4 rows of 1/2" tubes. The filler neck is just to the driver side of center. The core height is 17.5" and it is 25" wide. The tanks are 3.25" thick. The trans cooler has 3/8" inverted TOC fittings. This radiator fits A/C cars. This radiator has 4rows of 1/2" tubes. The filler neck is just to the driver side of center. The core height is 15.5" and it is 25" wide. The tanks are 3.25" thick. The trans cooler has 3/8" inverted TOC fittings. Fits non A/C cars. Made in USA!! This radiator has 4 rows of 1/2" tubes. The filler neck is just to the driver side of center. The core height is 15.5" and it is 25" wide. The tanks are 3.25" thick. The trans cooler has 3/8" inverted TOC fittings. This radiator fits non A/C cars. New copper 3 row radiator for a 66 to 69 Charger, Satellite, Belvedere, Roadrunner and GTX. Equivilant to the largest radiator Chrysler put into these musclecars. Necks set for big block at top right & bottom left. It has a 10" transmission cooler. New copper High Eff 3 row radiator for a 66 to 69 Charger, Satellite, Belvedere, Roadrunner & GTX. Better than the largest radiator Chrysler put into these musclecars. Necks set for big block at top right & bottom left. It has a 10" transmission cooler. New copper 4 row radiator for a 66 to 69 Charger, Satellite, Belvedere, Roadrunner and GTX. Exceeds cooling of the largest radiator Chrysler put into these musclecars. Necks set for big block at top right & bottom left. Has a 10" transmission cooler. 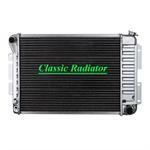 New aluminum 2 row radiator for a 66 to 69 Charger, Satellite, Belvedere, Roadrunner and GTX. Exceeds the largest radiator Chrysler put into these musclecars. Necks set for big block at top right & bottom left. It has a 10" transmission cooler. New copper 3 row HE radiator for a 66 to 69 Charger, Satellite, Belvedere, Roadrunner, Coronet & GTX. Equivilant to the largest radiator Chrysler put into these musclecars. Necks set for small block at top center & bottom left. It has a 10" trans cooler. New copper 4 row radiator for a 66 to 69 "B" body Charger, Satellite, Belvedere, Roadrunner and GTX. Exceeds cooling of the largest radiator Chrysler put into these musclecars. Necks set for big block at top left & bottom left. Has a transmission cooler. 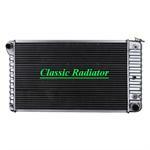 New aluminum radiator for a 66 to 69 Charger, Satellite, Belvedere, Roadrunner and GTX. Exceeds cooling of the largest radiator Chrysler put into these musclecars. Necks set for big block at top right & bottom left. Has a transmission cooler. This radiator has 3 rows of 1/2" tubes on 7/16" centers providing the same cooling as a regular 4 row core. It has a trans cooler. The filler neck is centered on the top tank. 17.25" tall X 23" wide core size. This radiator has 3 rows of 1/2" tubes on 7/16" centers. This allows it to cool as well as a conventional 4 row core. It has a trans cooler. Its appearance and fit is the same as OEM. This radiator has 4 rows of 1/2" tubes. It has a trans cooler. The mounting straps are soldered to the tanks just like the OEM radiator. the core measures 23" between the tanks. This radiator has 4 rows of 1/2" tubes. It does not have a trans cooler. The mounting straps are soldered to the tanks just like the OEM radiator. the core measures 23" between the tanks. 67-69 Camaro with HD cooling option and 67-69 Firebird with small V-8 & 6 cyl engine. The core width is 23". It has a transmission oil cooler and side brackets for bolting to the radiator support. It is a copper core with three rows of 1/2" tubes. This Griffin replacement radiator has a 22" core width and is 18 1/2" tall. It has two rows of 1 1/4" tubes. The top neck is 1 1/2" diameter and the lower is 1 3/4". It will cool up to 600 horsepower. Fits 67-69 Camaro,64-65 Chevelle and others. This Griffin combo unit has a 22" core width and is 18 1/2" tall. It has two rows of 1 1/4" tubes. The top neck is 1 1/2" diameter and the lower is 1 3/4". It will cool up to 600 horsepower. Fits 67-69 Camaro,64-65 Chevelle, + others. For manual trans. This Griffin replacement radiator has a 22" core width and is 18 1/2" tall. It has two rows of 1 1/4" tubes and a 12 1/2" trans cooler. The top neck is 1 1/2" diameter and the lower is 1 3/4". It will cool up to 600 horsepower.